If you have a body mass index (BMI) of 40 or more (“morbidly obese” or “super obese) along with serious obesity-related health problems like high blood pressure, high cholesterol, Type 2 diabetes and sleep apnea and are looking for a reliable surgical option for rapid and long-lasting weight loss, Gastric Bypass is the Gold Standard option for you. Gastric Bypass today is a major weight-loss surgery that uses minor incisions. Unlike conventional “open” gastric bypass surgery, which often requires a foot-long incision, laparoscopic Gastric Bypass surgery avoids any large incisions. Laparoscopic Gastric Bypass surgery (Roux-en-Y) is generally considered to be the best and a long-term surgical procedure for the treatment of morbid obesity. Weight loss is achieved by reducing the functional portion of the stomach to a pouch about the size of an egg and by bypassing about 100 cm. to 150 cm. of small intestine. 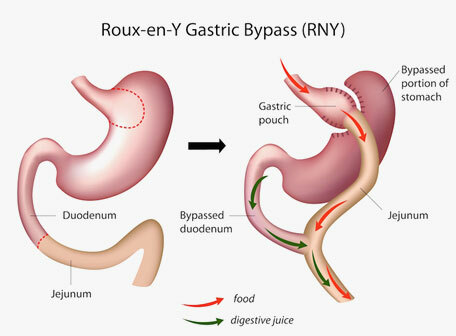 Roux-en-Y gastric bypass works by combining both restrictive and mal-absorptive elements. The restrictive element can be achieved by stapling the stomach into two sections. The top section becomes a small pouch that serves as the "new" stomach. The small size of this newly formed stomach is so reduced that it "restricts" or limits the amount of food intake and also provides a feeling of fullness and satisfaction with smaller portions of food. The lower section of the stomach no longer receives, stores, and mixes food but remains functional by continuing to secrete digestive juices. The mal-absorptive element in gastric bypass is achieved by surgically dividing the small intestine in a certain area. Once divided, the lower part of the intestine (jejunum) is pulled up to directly connect to the small pouch or "new" stomach. As a result, when food is eaten, it enters the "new" stomach, then travels into the jejunum, first "bypassing" the upper part of the intestine. The effect of bypassing the upper portion of the intestine decreases the amount of calories and nutrients that are absorbed into the body. The Roux-en-Y gastric bypass may be performed with a laparoscope rather than through an open incision. This procedure uses several small incisions and three or more laparoscopes, small thin tubes with video cameras attached, to visualize the inside of the abdomen during the operation. Gastric bypass surgery at Allure MedSpa can be performed laparoscopically for some patients. This latest highly popular technique offers a reduced rate of complications, minimizes scarring and may improves comfort and shortens recovery time. At Allure MedSpa, patients undergoing Gastric Bypass can expect the finest care from a team of truly talented medical specialists under the able guidance of renowned Bariatric Surgeon Dr. Milan Doshi. In the right hands, this is a very safe procedure. Our results are consistently one of the best in the world and rank among the very top in the country. Most patients lose weight quickly and continue to do so for as long as 18 to 24 months after the procedure. Most patients lose 75% of their extra weight. As a result of this weight loss, many patients achieve greatly improved health. The Gastric Banding procedure is done under general anesthesia. At AMS, we understand how critical anesthesia is to a surgery. Hence we have highly trained anesthetists who administer it with minutest care and ensure you have a discomfort free surgery. Hospital stay for a Gastric Bypass is usually 48 - 72 hours. Full surgical recovery usually occurs within about three weeks. Allure MedSpa which is renowned for its state-of-the-art internationally acclaimed services,offers affordable and cost effective bariatric procedures. To know more about the cost of your procedure request a consult by filling the form below.Your consultation is your chance to ask questions about Gastric Bypass surgery and put your mind at rest. If you have a body mass index (BMI) of 40 or more (“morbidly obese” or “super obese) along with serious obesity-related health problems like high blood pressure, high cholesterol, Type 2 diabetes and sleep apnea, your surgeon will review your specific health issues and concerns and evaluate all your chances and help you take the right decision. At Allure MedSpa, we don’t simply provide surgical solutions to obesity; we recognize your needs extend beyond the surgical procedure itself. Our dedicated post-surgical section is designed with your comfort and care in mind. Our entire staff from to the expert team of anesthesiologists to nurses, will ensure you are treated with utmost care and warmth. Our comprehensive aftercare program focuses on your unique, individual needs. A nurse, dietitian and fitness advisor work with you to provide all the help, support and expert advice you require to alter your behaviors and your relationship with food by creating an individual aftercare plan specific to you. In addition to a complete medical history, you will undergo blood tests or other diagnostic tests. If you're a woman of child-bearing age, you may receive birth control counselling so that you do not become pregnant in your first year after surgery due to the risk to the fetus from rapid weight loss. Quit smoking and discontinue the use of all tobacco and nicotine products as it may lead to delayed wound healing after the surgery. Drink more water and limit other beverages. Stay mentally and physically fit by focusing on your health. Not to eat or drink anything for 10-12 hours before surgery and have a light dinner because the stomach must be empty before anesthesia. Ask a friend or family members to be at the hospital during the surgery for support. Allure MedSpa’s clientele comprises of local, out-of-town patients. A good percentage of patients also "fly-in" from out of the country to have surgery with our renowned surgeons. Most patients lose weight quickly and continue to do so for as long as 18 to 24 months after the procedure. Most patients lose 75% of their extra weight. Most patients lose weight quickly and continue to do so for as long as 18 to 24 months after the procedure. Most patients lose 75% of their extra weight. As a result of this weight loss, many patients achieve greatly improved health. Compared to all the types of bariatric surgery, gastric bypass is the one of the best in terms of long-term success. My wedding is next year and I was finding it very difficult to lose that weight. I am 5 feet 6 inches tall and I am overweight. I have the condition of thyroid and is finding extremely difficult to lose the extra weight from my body. I went to gym and even tried controlling my diet, however did not find any solution for the same. I was quite distressed, with only few months left for my surgery, how am I going to shed those extra kilos. My little sister one day suggested me to opt for a surgery, but I was not too sure about the concept. I was worried about the side effects. So for confirmation I called up at Allure Medspa. The staff arranged for a conversation with Dr. Milan Doshi. Dr. Doshi patiently listened to all my queries and suggested me to take the Laparoscopic Roux En Y procedure for weight loss. I trusted him completely and followed his advice. I came to India for the surgery. Next day I visited Dr. Milan Doshi\'s clinic Allure Medspa where my treatment took place. The surgery took couple of hours to complete. I was advised to follow a liquid diet for few weeks. Now, its few months after the surgery and I have lost couple of kilos. I feel lighter now. Hopefully, during the wedding day I will be couple of more stones more lighter. What is Laparoscopic Roux En Y Surgery ? The procedure is undertaken by those who are overweight or obese. This surgery is opted if your body mass index crosses the limit 40. In Roux-En-Y Gastric Bypass, only a small part of stomach is used to create a new stomach pouch, which is estimated to a size of an egg. The smaller stomach is connected to the middle portion of the small intestine, bypassing the rest of the stomach and the upper part of the small intestine. Can I have normal meal after the surgery? Immediately after the surgery, you will be allowed to consume only soft foods and liquids. This will help in faster recovery process. After few weeks you can start with your normal diet upon recommendation of your surgeon. Absolutely, it is a very safe surgery. For first few weeks you will have to consume soft foods and liquids. Before conducting the surgery, Dr. Milan Doshi will discuss about its side effects during the consultation process. The surgery is for overweight and obese people who is resistant to any form of exercise and diet. This surgery is opted if your body mass index crosses the limit 40. Will my diet change after the surgery? Yes, every person meets the dietician before the surgery. The dietician will help you to learn the techniques of healthy eating that will help you to maintain a healthy diet. It is best to eliminate sweets and fatty substances to maintain a healthy weight. Recovery period will vary from person to person. However, it will take 2 to 3 weeks times to fully recover after the surgery. Your surgeon will advice you about the time you can return to your work. Will I be able to consume aerated drinks? It is advised to avoid aerated drinks completely as it fills and stretches the new pouch. Can I regain weight after the surgery? Yes, there is every possibility that you might gain weight if you do not maintain healthy eating habits. What is the cost of Laparoscopic Roux En Y?